EMI gaskets are a type of physical EMF (electromagnetic field) protection, much like EMI enclosures, or “faraday cages,” which protect sensitive electronic equipment from electromagnetic interference by surrounding EMI sensitive or EMI emitting electronic equipment and absorbing the harmful EMI and RFI. Spring-Line Beryllium-Copper Gaskets – Sealing Devices Inc. Shielding sensitive electronic equipment from electromagnetic interference (and shielding high EMI-emitting equipment from contaminating other equipment) can be achieved by encasing EMI sensitive or EMI emitting circuits in EMI enclosures. Electronic equipment manufacturers and suppliers use EMI gaskets in applications for both internal and external shielding such as electrical automotive systems, circuit board housings, central processing units, laptops and desktop computer housings. To ensure maximum EMI and RFI containment, EMI gaskets are frequently paired with EMI enclosures to seal gaps, seams and joints, making EMI gaskets often a necessary product in EMI enclosure assemblies. EMI gaskets are made from electrically conductive rubber materials such as silicone, nitrile and styrene butadiene rubber (SBR) and are often manufactured in combination with EMI shielding metals such as Mu Metal®. 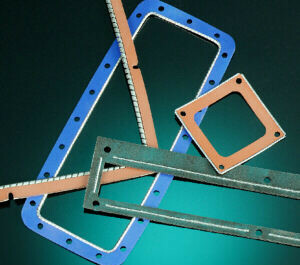 Like gaskets for non-EMI applications, EMI gaskets are often die-cut with precision shapes and holes. Die cutting is the process of stamping or cutting two dimensional parts out of flat sheets of material. Another method of manufacturing EMI gaskets is extrusion. In this process, EMI gaskets are extruded into gasket strips, the process of which involves squeezing heated EMI materials through a die for shaping. In addition, EMI gaskets can even be extruded and then bonded to magnetically conductive metals such as nickel (and its various alloys), copper or aluminum. The rubber to metal bonding process adheres rubber to a metal substrate in order to form a product with a permanent, air and water tight seal between the two materials. As electronic equipment advances and electromagnetic and radio frequencies become higher and stronger, EMI gaskets are used for more robust protection against radio frequency signals which penetrate cracks, gaps, seams and any unprotected area to cause equipment malfunction and failure. EMI Gaskets EMI (electromagnetic interference) gaskets are used to isolate different components of an electrical device from one another, and thus create more robust EMI and RFI (radio frequency interference) protection by preventing the leakage of EMI in or out of an enclosure through seams or gaps.